Blake Calvert (right), CORE President & CEO accepting Zweig Group’s Top New Venture Award from Mark Zweig (left) at the Hot Firm Conference in Dallas. 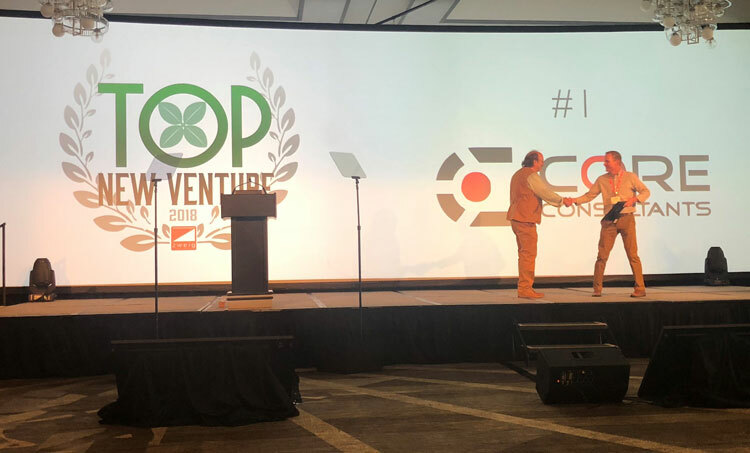 Littleton, Colo. — CORE Consultants, Inc., a Colorado-based civil engineering, natural resources, and land surveying firm, was recognized as the #1 Top New Venture at Zweig Group’s Hot Firm Conference in Dallas last week. Zweig Group’s Top New Venture is the newest honor in their prestigious A/E Industry awards. The award was judged on a number of factors including revenue growth, culture and making a positive impact on the industry. The Top New Venture Award comes at the heels of a number of local and national recognitions for the Colorado start-up. In June, CORE was ranked as one of Zweig’s 2018 Best Firms to Work For (#29) and Denver Business Journal’s Best Places to Work (#8 – Medium Company). In August, CORE was ranked #878 on the prestigious Inc. 5000. CORE has also been named as a finalist for Denver Business Journal’s Fast 50 — the 50 fastest growing Denver-area companies, which will be honored in October.